Floodlights with motion detectors can be effective in deterring people from wandering around your home. They are relatively inexpensive and can be installed easily. 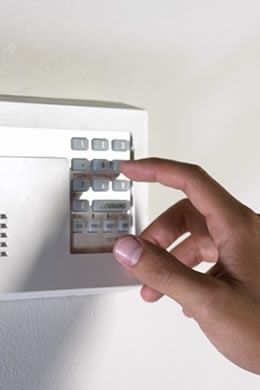 If you have an alarm system, arm it, even if you are going to be gone for a short period of time. You should have sensors on doors, windows, motion detectors and or glass breakage sensors. Back up all of your computers regularly. It is devastating to lose years of family pictures or other valuable information because a thief took your computer. Keep a file with all serial numbers of your electronics which can help police recover them. Neighborhood Watch: Watch out for your neighbor’s property and call police if you see anything suspicious. A good rule of thumb is to call if you wonder whether or not you should call. When in doubt make the call. Door-to-Door Peddlers: All door-to-door sales persons must be licensed to do so. Be aware. A common scam involves people claiming to be out of gas or that their vehicle is disabled. They ask for a loan or money to help them out. Do not give money to anyone who comes to your door that you do not know. Any time an individual approaches you and states that they have material left over from another job, whether it is chemicals, asphalt or whatever, be suspicious.